This entry was posted in Books and tagged books, reading, Reading Log by David Allen. Bookmark the permalink. I spent the first half of the month finishing Tony Hillerman’s Navajo detective series, and enjoying it a lot. Besides learning about Navajo culture and the beauty of the Four Corners area, I like Hillerman’s writing style and quality. Plus the books are old enough to still have had decent editors and proofreaders. Next I read Liane Moriarty’s Truly Madly Guilty. The book goes in two directions at once, with some chapters leading up to a tragic event at a backyard BBQ, and some chapters relating to the aftermath of the event. You are quite a ways into the book before you learn what the event actually was. I’ve really enjoyed Moriarty’s books, and look forward to reading more. After that I did a little research and found that Tony Hillerman’s daughter Anne has continued his series. I considered getting the first of her books, but in the meantime I found a different series by Aimee and David Thurlo featuring a Navajo woman who has become an FBI agent, moved off the Res, then comes back and becomes a Navajo Tribal cop. I read the first book, Blackening Song, and while I mostly enjoyed it, it contains more supernatural elements than I really like. I might read the second book to see if that continues before I give up. But the story, the characters, etc. are well done. I did notice a number of reviews on Amazon comparing this series to Hillerman’s and not liking it, but I think that’s unfair. Give the series a chance to be itself, not something else. After that I paid a visit to the Book Rack in La Verne, asked the owner for some recommendations, and took home two of her suggestions. One was Shakespeare’s Trollop by Charlaine Harris. While it wasn’t a bad book, and I know Harris is a popular writer, I was a little uncomfortable with the really dark events in the main character’s past. The series is worth a second try, though. The other of the two recommendations was “Tombstone Courage” by J.A. Jance, the second in her Joanna Brady series. I liked this a lot. Brady’s husband was a cop killed in the line of duty. He had been running for sheriff, so Joanna steps in, runs in his place and wins the election. I went back and read the first book, Desert Heat, to learn how this all happened, and am now in the middle of the third book where she’s taking a course in police procedures, although I guess I should save that for the September reading log! Nice work, Deb. This entry beats those months when you say, “I may have read a dozen mysteries but can’t remember all the titles.” You do love your series, don’t you? And I applaud your mention of the better care in proofreading and editing that is, sadly, more typical of older books than newer ones. I do like series. I think I enjoy getting to know a character and following their life. And I tend to like series where the character develops, ages, grows, changes, as opposed to those where the character is always the same. I know even the best series are a little formulaic, but I really get tired of reading the same book over and over (it’s why I abandoned Janet Evanovich). Deb, glad you enjoyed Truly Madly Guilty! I have also read a few J.A. Jance which I enjoyed also. As early as page 2 or 3 I thought, Do I really want to read this? But I kept going, and it turned out that yes, I did want to read this! Wow! Wow! What a powerful (nonfiction) story about an innocent man being on death row for almost 30 years — yes, I said 30!!! And such a loving, forgiving man. He is an inspiration to us all. A very cute third book in the Miss Buncle series. Just fun and easy to read with quirky characters and intriguing situations, set during WWII in a small English village. Sit back in your easy chair and a cup of tea for this one, and enjoy! I was so mad when I finished this book — because I did not want it to end!! Anne Tyler is one of my very favorite authors. She makes me feel wonderful things with her writing. Her unique stories and quirky characters feel like something that could happen to you and people you could know – would like to know. And the main character is usually a fairly quiet person who kind of stands back and lets everything happen around them. I love it! In this story, after reading about Willa’s childhood and early adult years, at around the age of 60, Willa receives a call from someone in Baltimore (Willa lives in Tucson) asking her to come and take care of her son’s ex-girlfriend’s child while Denise (the ex-girlfriend) is in the hospital after an accidental shooting. And Willa just goes! She just goes! She knows none of these people: Denise, (who she never met when her son was dating her), the child, or the person who calls and asks her to come! And they all become a part of each other’s lives. You can easily see how they need each other and care for each other. There is also the little mystery of who shot Denise. This is a very compelling story, slow-paced, but somehow tugs at your heartstrings. I loved it! I was pleasantly surprised with this book! It takes place in the late 1700’s in rural England, so it is fairly slow-paced. That being said, there is a pretty interesting story of intrigue, with a little mystery too. It is sweet and sad, and disturbing too. But — maybe because I was kind of dreading reading it — I’ll have to say that I really enjoyed it! It is a little raw in places, but the underlying feeling is very vulnerable, IMO. I can’t recommend it to everyone, but I personally wouldn’t have missed it! Wow! So powerful! Everyone should read this just to absorb this man’s positive attitude and outlook on life — even as he was dying. Again, Wow! This was really cute — and I mean that as a compliment! It is written in letter form, as Jay Fitger, who teaches at Payne University, writes letters of recommendation for many students and colleagues, and these letters are really doozies! I will tell you — you don’t want him to write one for you! The reader also learns lots about Fitger’s personal life in these letters. Altogether, it is very humorous and I am very much looking forward to the sequel “The Shakespeare Requirement” that has recently come out! I really enjoyed this book of Cyril Avery, born in Ireland in 1945, and the story of his life and personal struggles as a gay man at a time when homosexuality is actually illegal. But as difficult as his life is: his birth mother has to give him up because of troublesome circumstances; he is adopted by a rather strange couple and has an unusual childhood; his obsession with his best friend; his search for love from a companion, a mother, a son; and even experiencing the deaths of several loved ones — there’s quite a bit going on here — again, as difficult as Cyril’s life is, it is a warm story, filled with humor and love. It is very well written making you feel that you want to keep reading this (almost) 600 page book. Again, I really enjoyed this book! At first in reading your comment I thought you were slacking a little this month, Terri. But then you got to George Eliot, and then a ways later you read a 600-pager, so you are still firing on all cylinders! I really like Ann Tyler, and George Eliot is another author I feel like I should have read but haven’t. Randy Pausch was a big Star Trek fan and got to appear in a scene on the bridge in the 2009 Star Trek movie! He was already sick and sadly died before the film was released, but it was the fulfillment of a dream for him. Yes!, Pausch talked a little bit about that in his book. It was very inspiring, but sad. A college English prof told me the greatest novels in the English language were Tom Jones, Emma, Middlemarch (by Eliot) and Bleak House. I read Tom Jones to impress him and it was such a struggle I *still* haven’t read any of the others. But I hope to! I’ve read Emma and Middlemarch. And I plan to read Tom Jones and Bleak House early next year! You remember the David Allen slog! Long before the David Allen blog! I’d forgotten that I’d set myself a quota on Tom Jones, which was a brutal read, at least at age 19 or 20. But that sounds like me. I do that a lot now, but that’s to try to finish books by the end of a given month to make the ol’ Reading Log’s deadline. I’m here! 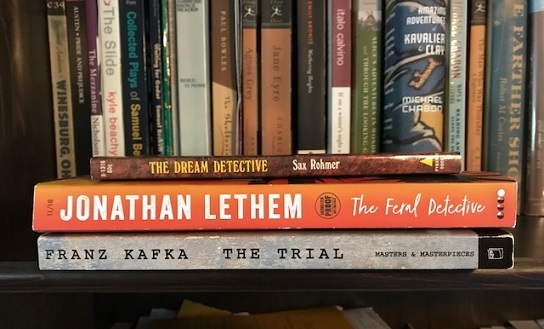 Ready to chime in with my books from last month… nineteen days after the start of the month, but only ten days after David posted, so maybe I’m doing all right? I read five last month! “The Hard Way” (2006) and “Bad Luck and Trouble” (2007) by Lee Child. Books 10 and 11 in the Jack Reacher series. My plan, back in January, was to read one of these a month until I got through the series, but at the end of my paparback copy of “The Hard Way” was the first chapter of “Back Luck and Trouble,” which I read, and had to see what happened next, so here we are. Since I already read books 1 and 9 in the series a couple of years ago, I am now well ahead of schedule. Go get ‘em, Jack Reacher! Go get ‘em, me! David Allen blog fans might be most interested in “Bad Luck and Trouble,” which takes place mostly in the Southern California area. Reacher’s home base for most of the book is a Denny’s on Hollywood Blvd., and he makes trips into Orange County and—909-shout-out!—the desert off the 15 past Barstow, which in the book is still part of LA County (at least, the LA County Sheriff’s Department has jurisdiction). Eat your heart out, 909. Still! Better than a scene in the 8th book, “The Enemy,” in which Reacher battles traffic from LAX all the way to Fort Irwin in the Mohave Desert in a grand total of 90 minutes. That’s some fast driving, Jack Reacher! “The Annotated Big Sleep” by Raymond Chandler, annotated and edited by Owen Hill, Pamela Jackson, and Anthony Dean Rizztuo (both 2018). Look at me with the Philip Marlowes! Both of these books were published in August… I don’t know if that was on purpose, but I read them both, so there’s that. “Only to Sleep” is the latest “authorized-by-the-dead-author’s-estate” Marlowe book, which I like to read for reasons I don’t fully understand. (Look for a new James Bond book coming to this blog sometime soon!) “Only…” features a retired Marlowe in the latter half of the 1980s, living in Mexico, asked to come out of retirement and investigate the mysterious death of some guy. You know the score. It took me a while to warm up to this version of the character… he’s certainly older, which I expected, and cynical, which was always part of his charm, but this version is cynical in a more morose, not as amusing way. Not as many wacky metaphors from this guy (like my favorite, from “Farewell, My Lovely”: “It was a blonde. A blonde to make a bishop kick a hole in a stained-glass window”). Also strange to me: Marlowe frequently flashes back to earlier cases, but almost all of the flashbacks take place in the ‘60s and later, after Chandler died and thus after any more books were published, at least until the estate started publishing more books. So we get brief glimpses of Marlowe’s earlier life, but almost none from the books that made him famous. Oh, well! Still an enjoyable book and fun to see a version of what Marlowe may have been up to while I was a freshman in college. Marlowe in the book is pretty old, as I’ve mentioned, so I don’t know how many more books we’ll get set after this one. “Annotated Big Sleep” is what it sounds like: the first Marlowe novel, published with annotations. Lots of fun stuff on LA in the ‘30s, the state of the private eye novel back when this was published, the effect of Marlowe on pop culture, etc. Recommended, but you certainly wouldn’t want to read this as your first time through the book. (Mild spoilers for the endings!) Interesting: in both “Big Sleep” and “Only to Sleep,” Marlowe cracks the case, only to decide to not turn the culprits in, answering to his own moral code. We know why he’s doing it, but the people who hired him don’t… with a success record like that, why do people keep hiring him? 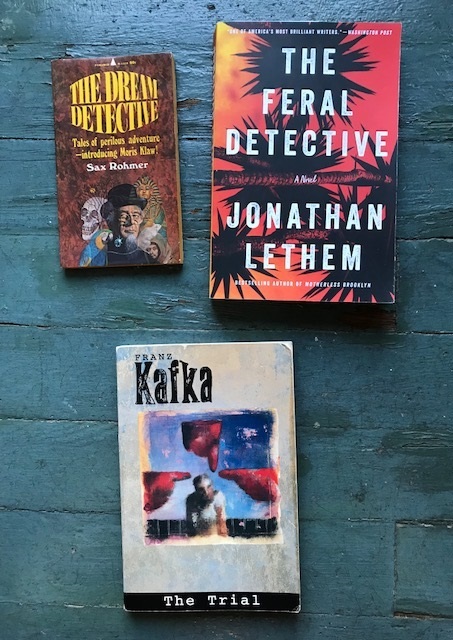 As for David’s books: “The Trial” is a classic I’ve never read and feel like I should have, and “The Feral Detective” sounds like a fun one to add to my list of someday-I’ll-get-to-this. I still have “The Fortress of Solitude” by Letham on my nightstand, making me feel guilty, so I should probably read that first. Next month! I decided on impulse to reread the Game of Thrones series, which is keeping me busy but is certainly slowing down my book count. See you all here next time, everyone! Of yours this month I have only read “Stardust.” I really like Neil Gaiman. I have “Good Omens” on audio and plan to listen to is soon! I’ve been wondering if you would read the new Marlowe and what you would think. Interesting that he cites unknown-to-the-reader cases (much like Dr. Watson used to do) and also that he doesn’t cite any cases from the canon. I’d think there might be licensing/rights issues, except, the book is authorized by the estate, so…? Your Lee Child examples are funny and make me wonder if he lives elsewhere. No SoCal person would be so off, would they? Even if they live in a bubble on the Westside, LA people know you can’t get much of anywhere from LAX in 90 minutes. I real Stardust when DC serialized it (the complete prose plus some illustrations) in four extra-length issues. The story made no impression at all and I’m not sure why I bothered except that it was published during or immediately after his Sandman run, which I enjoyed. Late to the party here too, but clearing things left over before October reports are dbue. Thirty Years On the Line. Leo D Stapleton. Boston firefighter, I remember a few of these stories from the Boston Globe. A lot of the best were among the lowest paid there and then. It is still true when it comes to Western wildfires. Persian Mirrors: The Elusive Face of Iran. Elaine Sciotilino 2000. Very good job on the interviews with the women and men of Iran, but badly flawed by the biases of most of her employers. 1812: The War That Forged A Nation. Wzlter R Barneman 2004. This was supposed to be taught to me in the 60s or early 70s. This version has its share of jingoism, but the basic story remains. Where I Was From. Joan Didion 2003. Didion has been described as a good essayist and a poor journalist. The good and bad are one display here. Thanks for your diligence in catching up, Richard. I can’t comment in any substantial way as I haven’t read any of your books, but it’s neat that Utopia ended up as your winner for the month on the fiction side of the ledger. Half a millennia later, Thomas More is still hanging tough! More wasn’t hanged, he got the axe. His head was posted on the north gate of the Old London Bridge (not the one ar Lake Havasu, but the one that lasted over 600 years without failure). His daughter removed his head and later arranged to have it buried with her. This bridge story is in one of my October books?